Documentaries on celebrity (or “celebrity”) personalities are certainly not few and far between these days, each and every celebrity, no matter how long they’ve been in the game, is getting their due biographical doc. Iris Apfel has been in the fashion industry for about 70 years (though she didn’t receive worldwide attention and acclaim until just 10 years ago), and her age is certainly reflective of her character – she is without arrogance and narcissism, instead her endless love for dressing up (as I’d call it) is infectious and rife with joyous, yet dry wit. 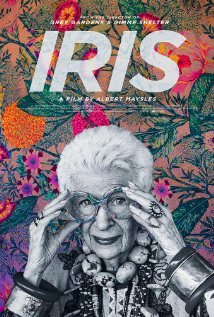 We follow Iris around her stomping ground in New York as she goes to fashion exhibitions, takes part in interviews and stuns her interviewees with her wry and often blunt answers, and of course goes shopping for new additions to her eccentric, overwhelming, yet completely individualistic style. Unlike plenty of fashion experts, she doesn’t support trends or give in to what’s in vogue, she stresses that people should dress for themselves and allow their clothing and accessories to express themselves. As this documentary solidly proves, Iris is a ball to have around. Her acerbic sense of humour is hilariously refreshing and comes from someone who’s old enough to not guard her thoughts, opinions, or personality. She claims she never judges peoples’ fashion tastes, meaning this film never features any criticism from her, just her own personal love for the clothes she, and others, wear. Her only match on the humour scale (and sometimes the fashion one) is her husband of 66 years, Carl — the two of them get along so youthfully together, it’s a long-lasting love that fills this documentary with even more positivity. Despite veteran documentary filmmaker Albert Maysles behind the camera (as we sometimes see literally), the star of the show easily overshadows the form. There’s only an aimlessness in the doco’s structure, meandering from one setting to the next with Iris, even some scenes and shots linger on … only for nothing to come of them. Perhaps Albert, who was in the same geriatric stage as Iris, wanted to express the quiet inactive moments of living at such an old age … or maybe he forgot the camera was still on. This all just seems like an excuse to get Iris on camera for 80 minutes, and I’m not complaining. I still feel like a better documentary could’ve been made around her, something with a bit more story to it (such as more said of Iris’ previous 92 years), or at least something with more progression to its narrative. But Iris herself rises above this standardly made flick and this works less as a film, but more of a very captivating video akin to a behind-the-scenes featurette.